Every year in celebrating Easter we relive the experience of the first disciples of Jesus, the experience of the encounter of Him risen: the Gospel of John tells that they saw Him appear in their midst in the Upper Room on the evening of the very day of the Resurrection, the first day of the week, and subsequently eight days later. That day, later called the Lord’s Day, was the day of the assembly of the Christian community which gathered for its own devotion, that is, to the Eucharist, a new form of worship which from the outset differed from the Judaic worship of the Sabbath. Indeed the celebration of the Lord’s Day is a very strong proof of Christ’s Resurrection, for only an extraordinary and overwhelming event could have induced the first Christians to begin a form of worship that differed with regard to the Jewish Sabbath. Then, as today, Christian worship is not only a commemoration of past events nor even a specific inner mystical experience; rather, it is essentially an encounter with the Risen Lord who lives in the dimension of God beyond time and space, and yet becomes really present amidst the community, speaks to us in the Sacred Scriptures and breaks the bread of eternal life for us. It is through these signs that we relive what the disciples experienced, that is, the event of seeing Jesus and at the same time of not recognizing Him; of touching His body, a real body and yet free from earthly bonds. What the Gospel says is very important namely, that Jesus, in His two appearances to the Apostles gathered in the Upper Room, repeats several times the greeting: Peace be with you. Here, the traditional greeting with which people wish one another shalom, peace, becomes something new: it becomes the gift of the peace that Jesus alone can give because it is the fruit of His radical victory over evil. The peace that Jesus gives to his friends is the fruit of the love of God which led Him to die on the cross, to pour out all His Blood, as a meek and humble lamb full of grace and truth. 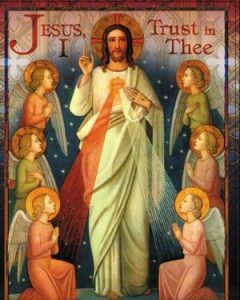 For this reason Blessed John Paul II chose to call this Sunday after Easter Divine Mercy, with a very specific image: that of Jesus’ pierced side from which blood and water flowed, according to the account of an eyewitness, the Apostle John. However, Jesus is now Risen and the Paschal sacraments of baptism and the Eucharist flow from Him, who is alive: those who receive them with faith receive the gift of eternal life. Dear brothers and sisters, let us accept the gift of peace which the Risen Jesus offers us; let us allow our hearts to be filled with His mercy! In this way, with the power of the Holy Spirit, the Spirit who raised Christ from the dead, we too can bring these Easter gifts to others. May Mary most holy obtain this for us.